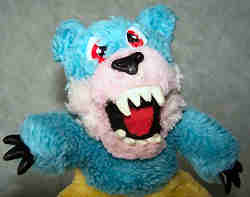 Howler has light blue fur with a pink face, paws and feet. He wears yellow shorts. The "evil" face has two rows of pointed teeth (four teeth on each row), similar to Grizzler. In his story, the WereBears overhear two dodgy men - Shfty Malone and Nasty Bygraves - planning to kidnap the famous ballet dancer, Dame Turnover. Howler goes to the theatre to foil the kidnap attempt, and succeeds after scaring the kidnappers with his howl, biting their legs, and scratching their hands to stop them getting away before the police arrive..